The large releases of energy in the solar atmosphere known as solar flares are a clear indicator of the highly dynamic magnetic nature of the Sun’s atmosphere. Several processes for initiating the release of this stored magnetic energy have been proposed (eg. ,  ), along with observational features that support these models. Additionally, there have been observational signatures identified prior to flaring that are yet to be conclusively linked to a flare trigger model, e.g. . This nugget describes the results of an investigation into the pre-flare period of an X1.0 flare observed on 29-March-2014, presented in a recent article . This event was captured concurrently by the IRIS and Hinode/EIS spectrometers, which were observing the active region (AR) from 14:09 UT until 17:57 UT on 29-March-2014, providing over two hours of uninterrupted coverage of the pre-flare behaviour of the AR. Non-potential magnetic field modelling was also carried out to determine the magnetic structure of the AR, to provide an extra constraint on the nature of any pre-flare activity observed. Within the fields of view of the Hinode/EIS and IRIS spectrometers we identified three sub regions of study, shown in the top left panel of Figure 1. The Fe XII 192.3 Å data within these regions observed by Hinode/EIS were fitted with single Gaussian profiles allowing the determination of Doppler velocity and non-thermal broadening. At 17:00 UT, ~40 minutes prior to flaring, sub-region B revealed the presence of enhanced non-thermal line broadening corresponding to a mean velocity value of ~70km/s, situated in between the bright feature indicated by the black arrow in the bottom left panel of Figure 1. The spectral lines in this sub region also exhibit Doppler shifts of 10s of km/s at the times of enhanced non-thermal broadening. Figure 1: AIA 193 Å images, detailing the coronal activity within the active region between 16:42 UT and 17:04 UT. The three sub-regions studied are highlighted in the top left panel. The bottom left panel highlight a bright coronal loop that crosses the filament at 17:00 UT, while the bottom right panel highlights an extended brightening along the path of the filament. Reproduced from . We then investigated the response of the lower atmosphere to this activity, by examining the evolution of the Hinode/EIS He II and IRIS Si IV and Mg II lines. This provides coverage of the lower atmosphere from the transition region to the chromosphere. 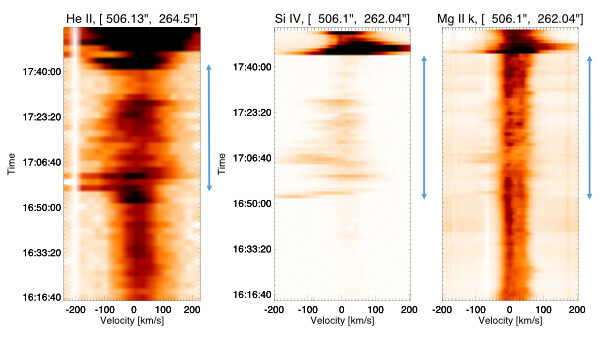 Figure 2 shows the time profiles of the three spectral lines for a pixel within sub-region B, the area showing pre-flare non-thermal velocity in the corona. We find that there is little activity observed in the line in sub-region B from 16:16 UT until ~16:52 UT. From this point we identify the onset of strongly blue shifted emission in the lines studied. These are particularly apparent in the Si IV observations, with blue shifts of up to -200km/s observed. This peak of this blue-shifted emission is concurrent with the peak non-thermal velocities observed in the same region in the coronal Fe XII data. Activity at lower velocities is then seen to continue until the onset of the X-flare ~40 minutes later. Figure 2: Time profiles of spectra recorded in sub-region B, He II, Si Iv and Mg II k lines are shown. There is very little activity seen in these lines until ~16:50UT, at which point strong blue shifts are seen, with velocities up to 200km/s. The blue arrows mark the time between the onset of the pre-flare activity and the start of the X-flare. Adapted from . The bottom right panel of Figure 1 marks the path of an extended bright feature seen in AIA 193 Å observations. The evolution of this feature, which appears to trace the path of the filament present in the active region, is also shown through the four panels of Figure 1. Figure 3 shows an animation of Si IV emission at -100km/s overlayed onto AIA 193 Å data. It can be clearly seen that the highly blue shifted emission closely follows the path of the extended bright feature. Figure 3: Animation of AIA 193 Å data with the same field of view as Figure 1 with IRIS Si IV data plotted at -100km/s overlayed. The locations of this strongly blue shifted emission is seen to follow the path of the extended bright feature seen in the AIA observations. 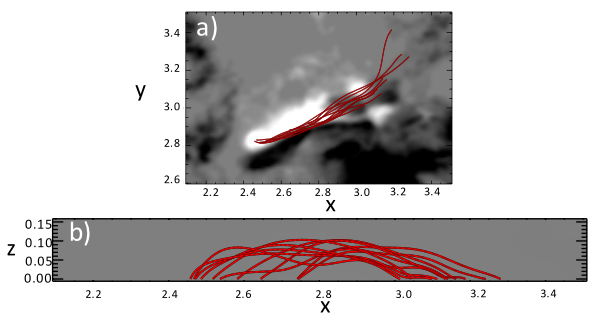 In order to narrow down the possible drivers of the observed fast flows, the magnetic structure of the active region was simulated using a continuous time-series of quasi-static, non-linear force-free fields. The simulation was run using HMI line-of-sight magnetograms with a 90 minute cadence between 16:30:31 UT on 27 March 2014 and 19:30:31 UT on 29 March 2014, and the non-potential magnetic fields produced using the techniques described in ,  and . It was found that strong shear builds up along the polarity inversion line of the active region, resulting in the formation of a magnetic flux rope by 16:30:31 UT on 29 March 2014 (Figure 4). This flux rope is located in the approximate position of the filament and exhibits a weakly twisted structure, with one turn along its length. Figure 4: Here we see the results of the modelling, showing the magnetic flux rope present within the active region at 16:30:31 UT on 29 March 2014. Panel (a) shows the top down perspective, whist panel (b) shows the flux rope in profile. Adapted from . What is driving the observed activity? The appearance of these strongly blue-shifted emissions observed along the length of the filament in numerous wavelengths leads to the question of what process is likely to have driven this activity. The combination of observational results and magnetic field modelling allows us to narrow down the most probable drivers from the most common models of flare triggering. One such driver could be kink instability, for which we would expect to observe blue and red shifts as a highly twisted flux rope untwists itself. However from our observations we only observe blue shifted plasma and from the simulations the flux rope is weakly twisted. We therefore rule out kink instability as a driver of the activity. We likewise rule out breakout reconnection as driving the fast flows due to their close proximity to the filament/flux rope. Fast flows of up to -200km/s have been previously observed in IRIS data , attributed to reconnection between two small flux ropes forming a larger flux rope. It is highly possible that we too are observing the effect of the formation of the flux rope. The location of the fast flows along the path of the filament presents tether cutting reconnection as another possible driver of the observed activity. We have identified strongly blue-shifted plasma flows, with velocity up to -200km/s, occurring along the path of an active region filament up to 40 minutes prior to the occurrence of an X-class flare. Using the observations in conjunction with magnetic field modelling we have determined that the most likely drivers of these fast flows are either reconnection within the flux rope, or tether-cutting reconnection. Antiochos, S.K., DeVore, C.R., Klimchuk, J.A. : 1999, Astrophys. J. 510, 485. Harra, L.K., Williams, D.R., Wallace, A.J., Magara, T., Hara, H., Tsuneta, S., Sterling, A.C., Doschek, G.A. : 2009, Astrophys. J. Lett. 691, L99. Woods, M.M., Harra, L.K., Matthews, S.A. Mackay, D.H., Dacie, S., Long, D.M. : 2017, Sol Phys. 292, 38. Mackay, D.H., Green, L.M., van Ballegooijen, A.: 2011, Astrophys. J. 729, 97. Mackay, D.H., DeVore, C.R., Antiochos, S.K. : 2014, Astrophys. J. 784, 164. Cheng, X., Ding, M.D., Fang, C.: 2015, Astrophys. J. 804, 82.